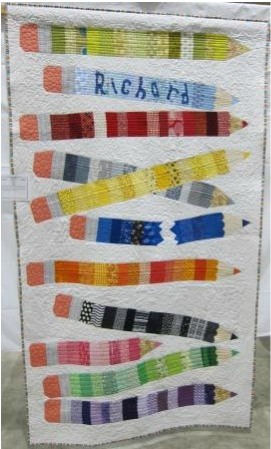 This is a photo detail of one of the quilts in the 2015 Quilt Show Raffle. The quilt on the left will be the 1st prize draw - a large bed quilt 84" X 96"
The quilt on the right will be the 2nd prize draw - a small bed quilt 60" X 72"
The 1st prize winner is Carol Beattie of Mississauga. The 2nd prize winner is Wendy Passmore of Orillia. 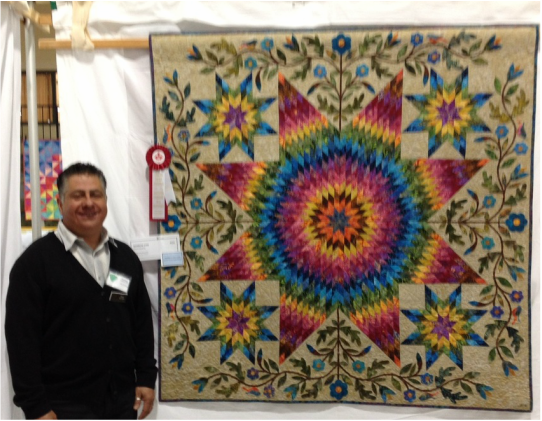 Paul Catania's quilt "Rainbow Star", a design by Edyta Sitar, received the CQA Award. 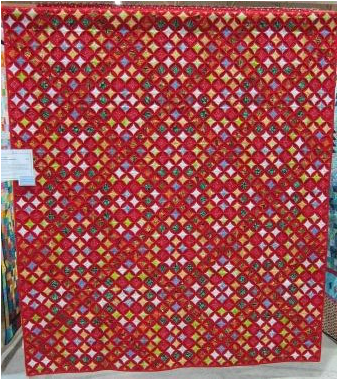 Description: This large quilt (88" X 100") was the 2013-2014 Block of the Month for our guild designed by Elaine Therieault and Mary Dodd. 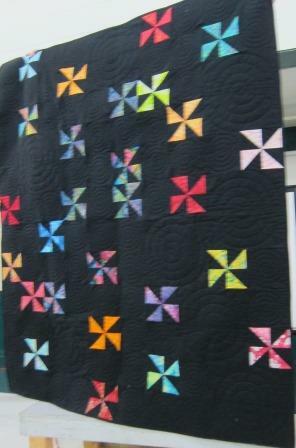 Since Heather wanted a larger quilt she added borders and continued with the central theme of stars etc. It reminded her of our earth and atmosphere, hence the name. 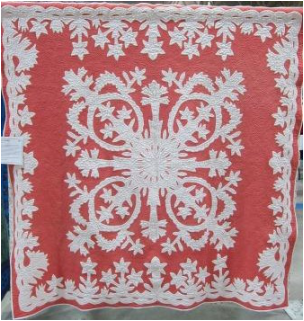 Description: This striking hand appliqued Hawaiin queen size quilt top (90" X 96") was found in an antique shop in Great Village, Nova Scotia, in 2012. 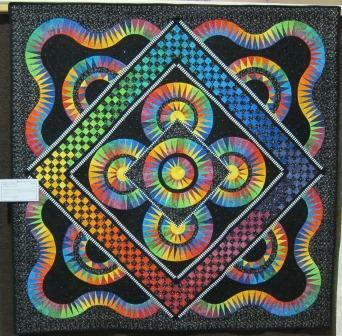 Techniques: It took Jane 2 years to painstakingly hand quilt this beautiful work of art. The flamingo pink background just makes you smile! Both Pikake (jasmine) and Tuberose are fragrant flowers used in leis. This will go to Jane's sister in law Debbie who has poured her heart into the well being of the whole family. Techniques: Machine pieced. Hand appliqued. Hand quilted. Additional embellishments. To commemorate the 100th anniversary of the great war (11914-1918), Jane assembled an eclectic collection of cigarette silks, handkerchiefs, buttons, navy ribbons, and even a tea cosy. This is all very elegant and nationalistic, but is in stark contrast to the cotton sling, preprinted with various treatment methods, heralding to destructive slaughter to come. 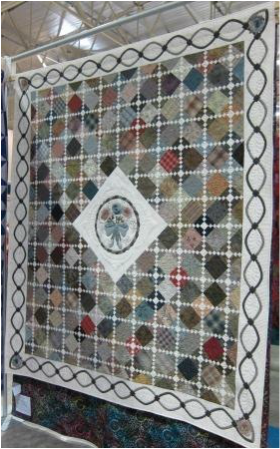 The back of the quilt is a red and white quilt top of the era, featuring white crosses. On them Jane has inscribed some historical facts, and the names of her relatives who went to war. 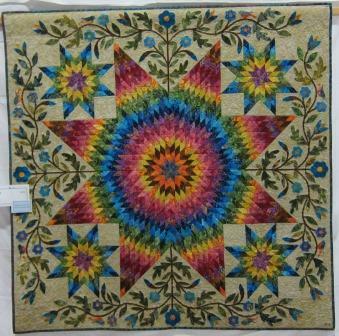 Designed, assembled and hand quilted by Jane. Finished December 2013. Techniques: Machine pieced. Machine quilted (long arm) by Paul. 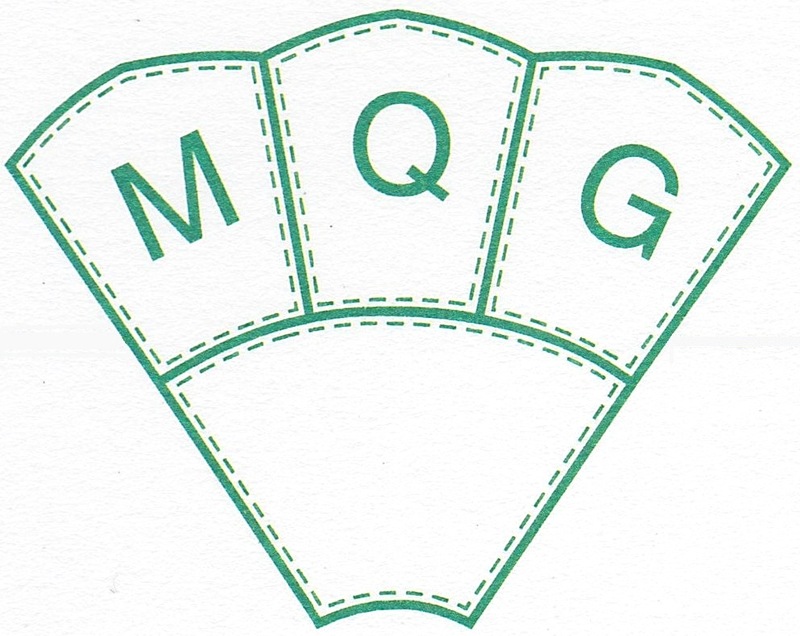 This is Paul's first time entering in MQG show. Elizabeth loves colours. They make her happy. As an adult she feels that she must compy with "proper" colour selections in her house and in what she wears. She finds it difficult to let go and do something different. This quilt is her first crack at this. Techniques: Paper pieced. Machine quilted by Elizabeth on her domestic machine. 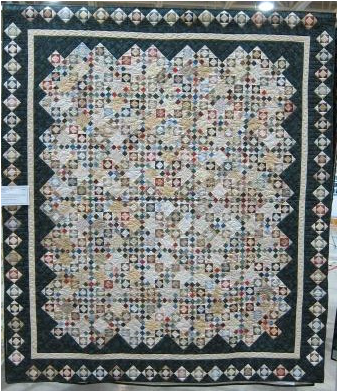 Description: This large (77" X 87") quilt is a design found in the book "Patchwork & Applique" by Pamela Tubby, Photo Nelson Hargreaves. This unusual combination of applique and patchwork is said to have originated on the Mayflower carrying the Pilgrams from England to America in the seventeenth century. 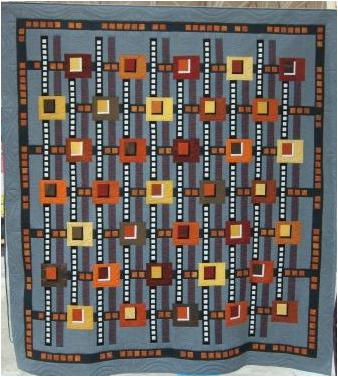 The foundation of this quilt forms the backing. The basis of the work is folding and refolding of squares of the foundation fabric, so the finished work is composed of many layers of fabric. This is another wonderful design by Dorothy Baker. Maxine had pieced the blocks before going to PEI this past summer. She just had the center block and the borders to do when she discovered that she had made a huge mistake with the center. It did not fit because it had been appliqued to the wrong size background. We learn by our mistakes and since Maxine had hand appliqued the circle, she was able to take it off and then machine appliqued it onto the correct size background. Dorothy was able to advise Maxine and help her overcome her mistake. Maxine says that there is so much to learn out there. 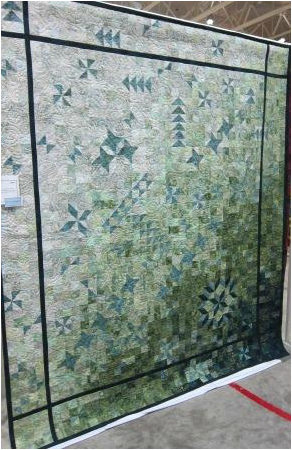 Description: This large (52" X 90") quilt was inspired by Janice's scrappy stash. Techniques: Machine pieced. Paper pieced. Machine quilted by Janice of her domestic machine. Janice likes wonky, quirky and colour. It would have been simpler to line up these crayons parallel to each other, but Janice loves to challenge herself: by snapping one crayon, sharpening another crayon and knocking a few sideways. 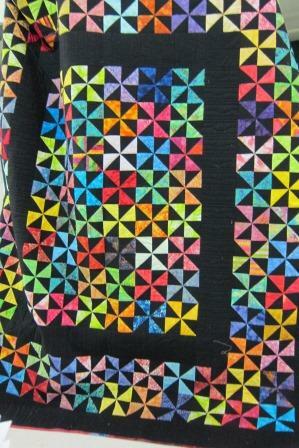 Janice found most of the fabrics in her scrap bags - wonderful!